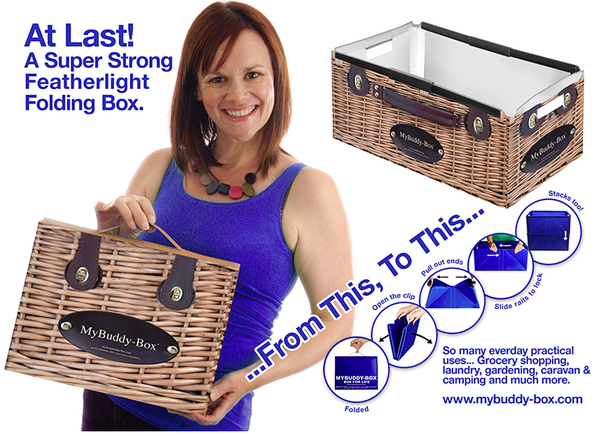 We manufacture and sell here in the UK a unique consumer product called MyBuddy-Box which is an attractive, long-lasting, folding, stackable box, which we have designed to give customers a better and practical alternative to single-use carriers and ‘floppy’bags. It is the green alternative to the plastic bags as we make them in 100% recycled material, thus making them 100% recyclable. We digitally print them in a number of different fun and eye catching designs. With the 2015 plastic bag tax confirmed, we have been gaining momentum with this product, having had a number of serious meetings with several of the UK supermarket chains. Our vision for MyBuddy-Box is is for them to be offered by the supermarkets as a customer service style product, which in turn will change customer behaviour away from using plastic bags. Being a brand new product, there is zero market awareness that it exists so consumers need educating that there is an alternative out there for them to transport their groceries home / for home delivery, click & collect etc. What we want to do by getting exposure for our product is to create consumer backing in the form of a pressure group who will get behind a campaign to force the hand of the supermarkets into providing this product to their customers. Whilst MyBuddy-Box was invented with supermarket shopping in mind – that said it has a multitude of other uses especially where you need temporary storage – laundry, caravan & camping, picnics/days out, general use in the back of the car etc. To get as much targeted product exposure as possible – we would be looking to collaborate with Parenting and lifestyle bloggers within the UK who would like to review MyBuddy-Box and become friends of the brand to get behind our campaign. We would be happy for you to hold giveaways for readers and would appreciate you including our website link.